Berths are in the forepeak and can be used as 2 singles or 1 double. The toilet is located under the seating on the Starboard side of the cabin. Moulded auxilllary outboard Bracket on swim platform. Transom access door for stern on moorings. Current BSC and Broads licensed. An ideal day boat/weekender the Sealine S200 is a compact stylish cruiser that can be used inshore or offshore. She is powered by a single Volvo TAMD22 105hp 4 cylinder diesel engine. She has a a few nice touches such as the Stainless steel folding radar arch and an electric windlass. she is a good looking boat with the right engine that will deliver both performance and economy. 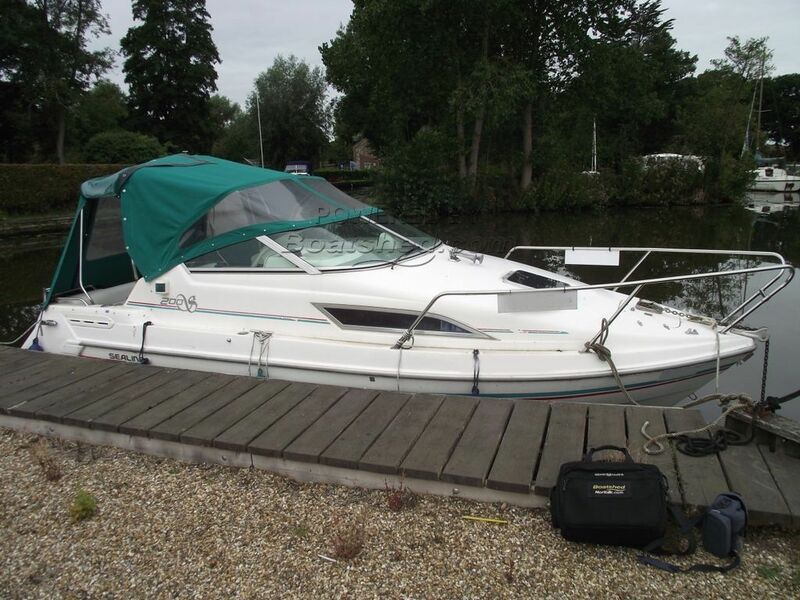 This Sealine S200 has been personally photographed and viewed by Gary of Boatshed Norfolk. Click here for contact details. Please note this comments section is public. Please do not post your personal details here. To enquire about purchasing this boat, please contact the broker directly at garytravis@boatshednorfolk.com. Please read our commenting guidelines before posting.